It’s rather fascinating how much Haydn Wood has remained unrecorded. Other than Snapshots of London, which is receiving its first digital recording, it seems as if everything else is new to disc of any kind, whether shellac, vinyl, or silver. That’s clearly good news for lovers of Wood’s insouciant, supremely well-crafted light music which can be enjoyed here in excellent SACD sound. Things open with the stirring 1949 Festival March, with Elgarian reminiscences, commissioned for the first Light Music Festival, and his only BBC commission for a new work. Snapshots of London came a year earlier, a triptych of real contrasts, from the rousing brio of the opening Ballet, the refined impression of Queen Mary’s Garden, Regent’s Park, and the devilishly fast Quick Step that ends proceedings. Before the war he wrote a Cook’s Tour picture postcard set of three Cities of Romance. Budapest may lack genuine paprika, but that slow-fast Hungarian Gypsy band feel is present. Maybe Wood recalled the recent past when London’s restaurants and hotels were littered with so-called Blue Hungarian bands, mostly populated by British musicians forbidden to talk to the clientele lest they give the game away. In his youth, of course, Wood had been a fine violinist and had even recorded as a solo fiddler. The solo playing here is by the BBC Concert Orchestra’s leader, Nathaniel Anderson-Frank and there’s fine percussion too. Venice’s languorous melody is cast in a kind of Barcarolle rhythm while Seville, though supposedly heard in Fiesta time, could just as easily be Italy or, whisper it quietly, Brighton on a particularly raucous Bank Holiday. Going back to 1929 draws a more mysterioso sense of travelogue from Wood. Recently rediscovered King Tut surely hovers over Egypta, cast in typical three-movement form and if Wood’s sense of the exotic is not especially serious, it’s rather more refined than, say, Ketèlbey’s broad-brush excitement. Dawn in the Valley of the Kings is not without nice features, not least the wind writing, and if the Slave Dance is more shimmy than Bacchanalia then The Court of the Pharaoh is more like it – a serpentine Straussian (Richard) dance with a complement of sublimated erotica. Haydn Wood loved the cinema as did any number of his peers – Bantock, for example, who was crazy about it. But Bantock never composed Three Famous Cinema Stars, featuring Ivor Novello (a Valse Apache, no less), Dolores Del Rio, for a succulent Elgarian romance, and Charlie Chaplin for a high-jinks finale. 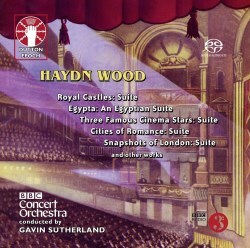 Wood reserves one of his memorable tunes for the central panel of the Royal Castles suite of 1952; lend an ear to the beguiling fluidity and nobility of Caernarvon, which is certainly more personalised than the perhaps appropriate formality of the concert waltz to celebrate Windsor Castle or the March King braggadocio of Balmoral. The disc ends with the two Manx Countryside Sketches, composed deep in wartime. The first is a relaxed, refined pastoral that wouldn’t have disgraced Julius Harrison and contrasts with the folksy jig that follows. It’s hats off to Gavin Sutherland, a real Ernest Tomlinson of our time, for his effervescent and committed direction of these all-too-little known pieces. He and the orchestra and Dutton have brought them to life with care, affection and a real sense of colour and charm.